Whenever I find fresh picked peaches, it’s cause for excitement, as Gluten Free Peach Pie is not far behind! 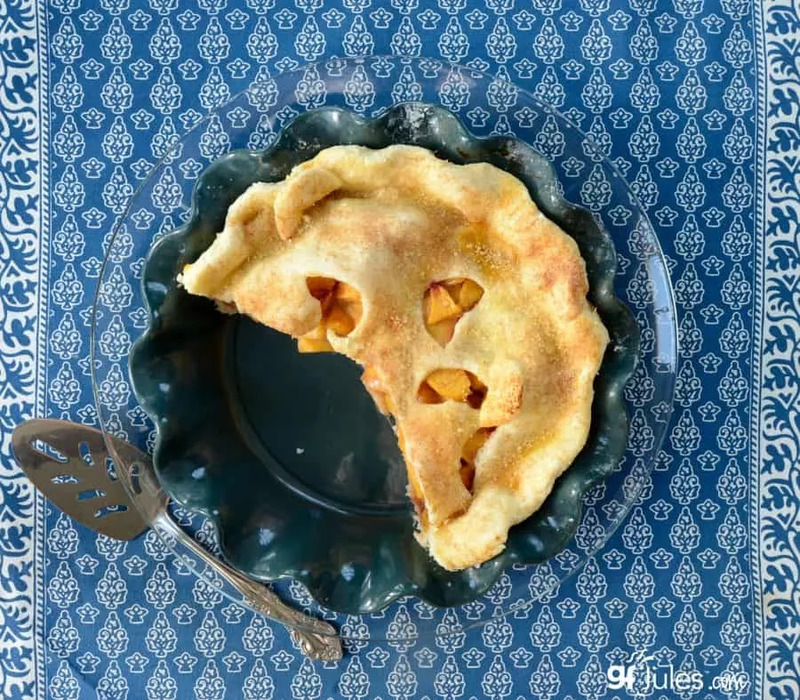 My family also loves to use fresh peaches for my mother’s quick and easy gluten free peach cobbler or crisp, but there’s something so iconic and special about going the extra mile and making a show-stopping gluten free peach pie. There’s nothing like the sweet, juicy taste of a peach, and there’s certainly hardly anything as delicious as a gluten free peach pie! My gluten free peach pie recipe is simple, relying on the natural goodness of nature’s candy and my flaky, tender gluten free pie crust. Don’t let the thought of making a gluten free pie crust daunt you, and certainly don’t think you have to buy one of those hard, dense pre-made gluten free crusts. No need to ever deprive yourself or settle for second (or third, fourth …) best. Ever. With my gfJules Flour and recipe, your crust will have the stretch it needs to make it easy to transfer into the pie dish, and it will bake up tender and flaky, just like a crust should be. So take a look at all my step-by-step photos and the helpful videos I have sprinkled throughout this recipe (in photos and in links), take a deep breath, and dive in!